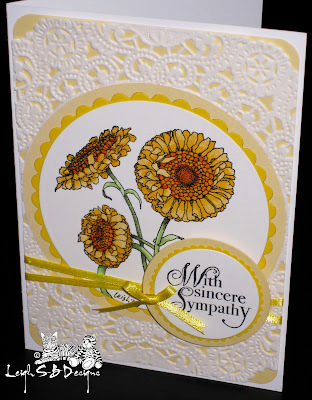 Velvet Paw Creations: " Calendula Sympathy Card " A Blockheads Design Team Tutorial!
" 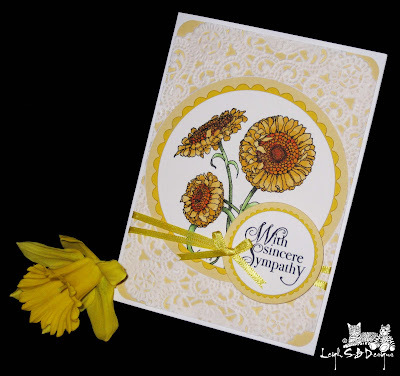 Calendula Sympathy Card " A Blockheads Design Team Tutorial! Thanks for stopping by my blog to check out my latest Design Team tutorial for Blockheads Paper Arts! 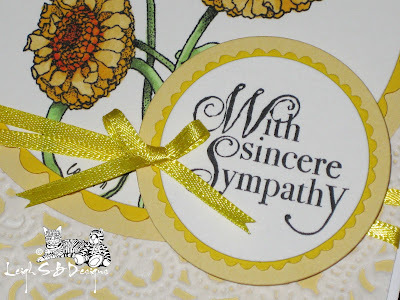 Unfortunately at some point we all need inspiration for Sympathy cards and sadly I needed to design this card when my husband's Aunt passed away earlier this year. I would like to dedicate this project to Aunty Jean, she will be remembered always! 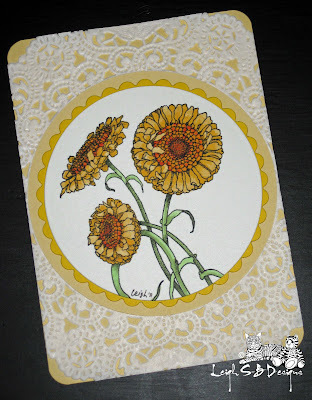 The main feature of my card is the gorgeous Calendula flower stamp available from Blockheads Paper Arts. This large flower image comes on the large Flowers Sheet unmounted or cut on cling cushion. 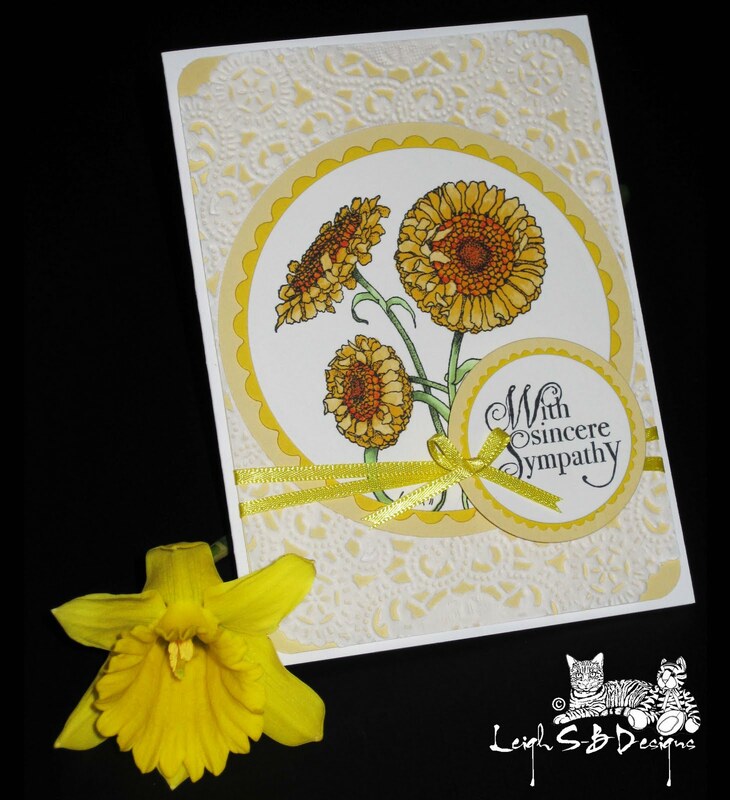 Some of the flowers from this collection are available individually too! Before inking up the Calendula flower stamp mask off the 'calendula' word portion of the stamp with sticky tape or the sticky part of a post-it note. Ink up the stamp with black Memento dye ink and remove the mask. 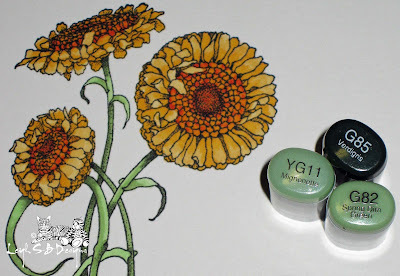 TIP: Memento dye ink is recommended for use with markers and watercolour techniques because the ink doesn't bleed when you colour over the stamped lines! Stamp the image onto a sheet of white cardstock or paper suitable for use with Copic markers. I actually like to use Strathmore Bristol 300 Series smooth paper which you can easily pick up at any arts and crafts store! 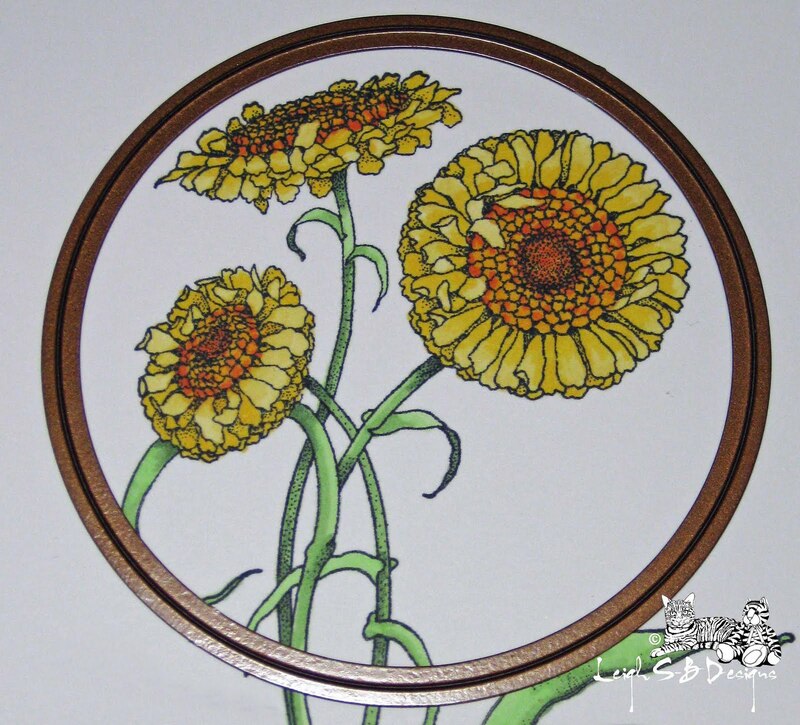 Colour the Calendula flowers with Y23 Yellowish Beige then add shading with Y17 Golden Yellow to just the petals. 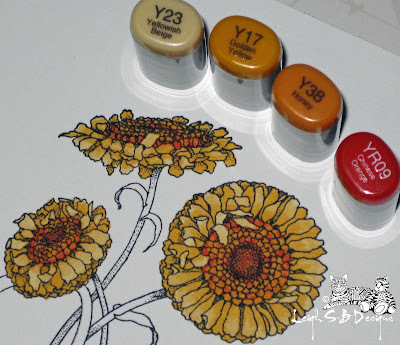 Colour the flower centers and add depth to the petals with Y38 Honey and blend with Y23. Add more colour to the flower centers with YR09 Chinese Orange and blend with Y38. Colour the stems and leaves with a combination of YG11, G82 and G85. Shade and add depth with the two darker colours and blend everything together with YG11. I played around with various Spellbinders die shapes by placing the actual dies over different areas of the flowers to see what shape and part of the stamped image I wanted to use and decided on a round Spellbinders die to cut out just the 3 main flowers as the main focal point of my card. Obviously for this particular card I used a 'With Sincere Sympathy' (Studio G) sentiment but this design could be used for any occasion as well just by switching out the sentiment stamp. I stamped the sentiment onto white cardstock in black Memento ink and cut it out with a Spellbinders die and also prepared a small set of the same mat styles I used for the main flower panel (which you'll see in the next photos). 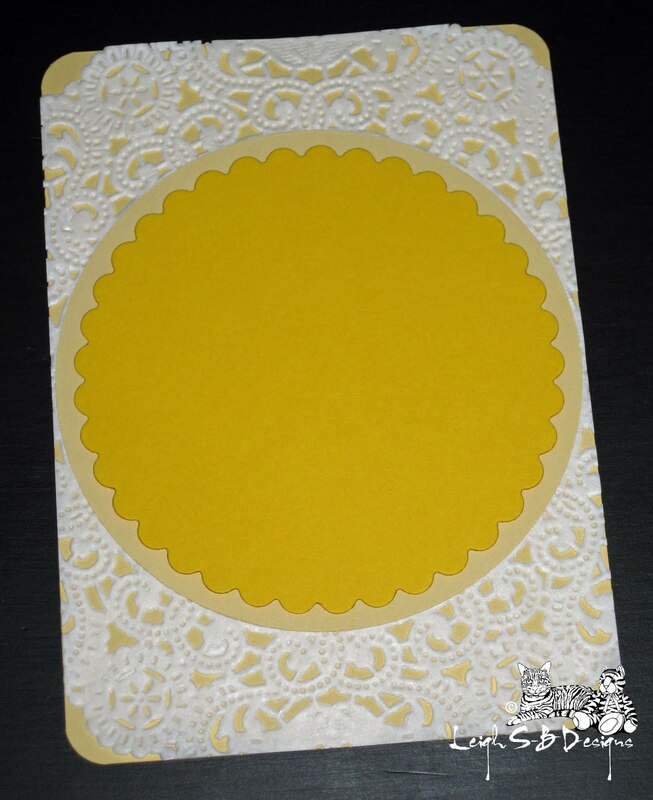 I decided to use an A2 size white blank folded card and cut out a lemon mat just slightly smaller than the card and rounded the corners with a Marvy corner punch. 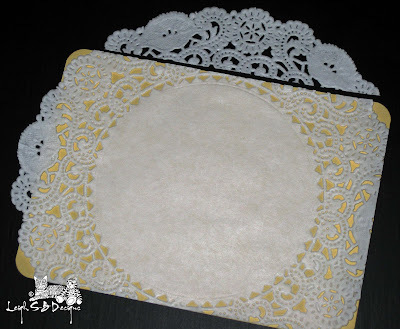 I then made a vintage lace-like mat from a large white doily and trimmed away the excess pieces and adhered it to the lemon mat with permanent adhesive. I used a Spellbinders die to cut a larger mat circle out of lemon cardstock the same size as the center of the doily and adhered it in place with permanent adhesive. 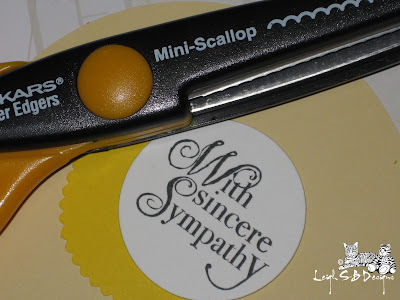 I used Fiskars fancy scissors to cut out a petite scallop mat from bright yellow cardstock just slightly larger than the flower panel and adhered it to the lemon circle. Then added the flower panel. 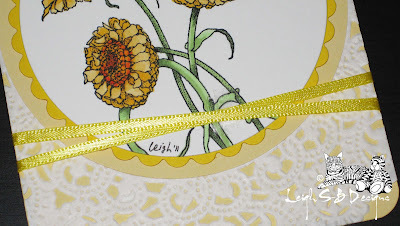 I cut a length of yellow satin ribbon and created a crisscross design on the front of the card. I assembled all the mats for the sentiment panel and adhered them to the card front with glue dots for slight dimension (coz this was going in the mail to the UK) and finished off my card with a yellow bow which I also attached with a glue dot. Well I hope you never have the need to make a sympathy card but at least I've given you some inspiration just in case! But don't forget that my card design can be adapted to fit any occasion just by switching out the sentiment stamp you use! I actually made a birthday card for my niece along the same lines, I'll share that one in the next couple of days! Karen, my fellow Blockhead, has some new release stamp eye-candy to share with you so dash on over to her blog and check out her duo of feathery creations! Lovely tribute, Leigh. 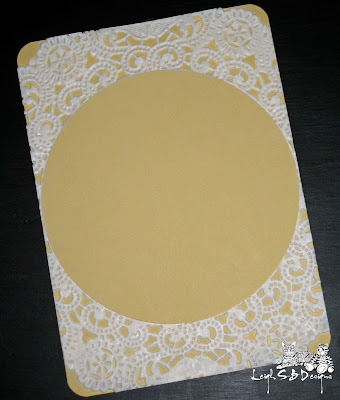 Your Copic coloring is fab and love the way you added the doily over the gold paper. Beautiful card Leigh! If Auntie Jean was here she would of loved it! The stamps set is absolutely beautiful, great flowers!